In this article for Mobile Strike you will find a Beginners Guide with tips, tricks and cheats for Android and iOS. This game is very similar to Game of War – Fire Age, so most concepts you have maybe learned there can be applied to Mobile Strike. Since Mobile Strike is partly very complex, the right strategy must be found to always emerge in the battles as the winner. While this is simple at the beginning, the difficulty increases while you progress through the game. Then, the right strategy and the right upgrades are necessary, you do not want to waste your energy. Feel free to leave us a comment, if you have some more Mobile Strike Tips that must be notified in this Beginners Guide. Build everything you can in your empty spaces in Mobile Strike. Inside your base, create your trading post, warehouse, radar station, hero Hall of Fame, prison, and split the rest between hospitals banks and troop training stations. You’re in game building guide will help you out with what to build at a basic level. Once you get a grasp of what’s going on, we would turn it off and build to your own specifications. We have more banks than hospitals, if that helps. Outside your base, split your resource evenly between farms, iron mines, oil fields, and quarries. We don’t bother with gold quarries, because we don’t feel that they’re that helpful. But that’s just our opinion, feel free to add gold quarries as desired. 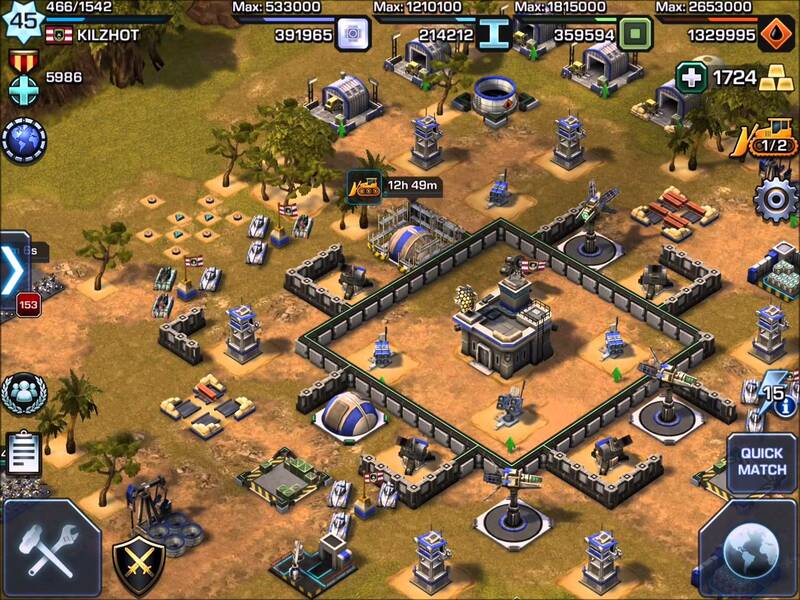 Always have traps, troops, building, and research in progress at Mobile Strike. Save a majority of your speed ups for research. Some folks will throw all of them at building and troops, but w/o research, your base will fall flat and not be well rounded in my opinion. If you want to grow quickly, spend them on troops. Use your commander skill points appropriately. You can build for resources vs attack vs defensive builds. Decide what you want to focus on, and use points accordingly. I would recommend filling the first tier (troop training and food production) enough to unlock the 2nd tier and filling research and construction ASAP. Wait on leveling your HQ until you have a majority of research and building done at current level. A common mistake is for people to primarily focus on HQ building. Past level 10, you will get your commander gobbled up, if you don’t have the power to support. Past 15, and he can be executed. Join a clan in Mobile Strike! They will help boost your building speed, get you free gifts, and opens up the social aspect. This will also grant access to the alliance store where you can buy different items with the loyalty points you accumulate through missions. You don’t need to keep food in storage for your troops. They can survive at 0 food. Only add it when you’re building/upgrading once you get a high troop count. Go to the shooting range as often as possible. It rewards speed ups, resources, etc in Mobile Strike. When you’re offline and above level 10, either put on a shield or go on a ghost rally. A ghost rally is picking a target, selecting rally for 8 hours and adding your troops and commander. This will keep the troops and commander safe. Farm tiles in your free time at Mobile Strike. This will help boost resource count and can also be donated to alliance members. If you have any more tips and tricks to get started in Mobile Strike, so please write in the comments. We will expand the article then accordingly. Are there cheats for Mobile Strike? Frequently the question is asked, whether there are Cheats for Mobile Strike to progress more quickly. We have to deny, however, because the app is funded through in-app purchases. So, if you want to progress faster and easier, you have to use real money. For PC games cheats are popular to progress faster and to gain an advantage. Therefore, it is not uncommon for people to think there are cheats for Mobile Strike to get ahead. As the game is available for free to download, the developers haven’t integrated cheat codes in the classical sense. On the Internet, however, you find numerous hacks for Mobile Strike as for example, an APK that allows you to get unlimited coins. But beware, these are not legal, and often hide Viruses and Trojans, which is a great danger, because they can cause unwanted costs for you. If you want to progress faster in Mobile Strike, use our tips instead of searching for cheat codes. Be the first to comment on "Mobile Strike – Beginners Guide with Cheats"